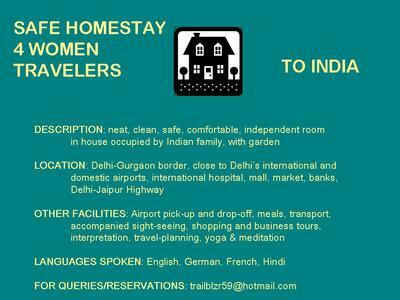 Very safe and comfortable for women travelers arriving in Delhi and wanting to travel to Jaipur, Agra, places in Punjab, Himachal etc. Interesting family, very helpful and knowledgeable. Assist with travel to off-beat places, offer yoga and meditation too. Highly recommended for single women or women traveling in small groups.